Electronics Costs > How Much Do Polaroid Cameras Cost? How Much Do Polaroid Cameras Cost? A Polaroid camera is a type of instant camera that immediately generates a developed film image. These instant films cameras were first developed by an American scientist in 1948. One common misconception is that the actual picture is a “Polaroid,” but actually, the picture is a simple piece of instance film that is ejected from an instant camera. How much does a Polaroid camera cost? On average, a new age Polaroid camera can retail for $65 to as much as $350. Antique cameras that are deemed collectibles, however, can cost much more. However, most vintage Polaroid cameras that are not deemed collectibles can be found for $30 to $90. The price of a Polaroid is going to be determined by the model of the camera, the age of the camera, and the features of the camera. Although Polaroid announced in 2008 that they were shutting down the manufacturing of instant cameras, they reopened their operations a year later. A new Polaroid camera, which works just like those built in the 1980s, can cost $50 to $125. For instance, the Polaroid One-Step 600 Instant Camera retails for about $60. The Polaroid 300 retails for about the same price. At Walmart, the costs can be in the $50 to $125 range. The popular Instagram Polaroid camera retails for close to $70 to $125, depending on the retailer. Extra costs may include the shipping fee. Because most Polaroid cameras are vintage, sellers suggest that you get insurance for the camera. You also have to factor in the film used in the Polaroid camera. On average, the film is usually sold around $15 to $40. Polaroid also offers film twin packs for a lower price. In addition, since a Polaroid camera is delicate, it is best to consider a camera bag. These camera bags can often cost $20 to $75 depending on the material. 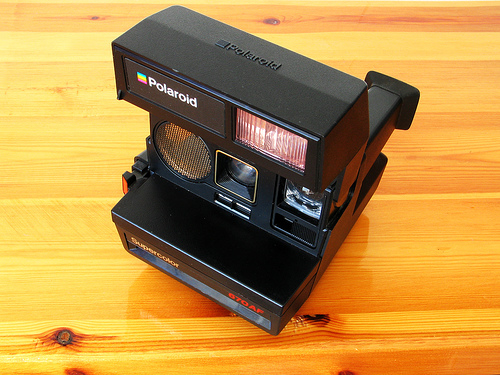 Most Polaroid cameras are vintage or used, but as stated above, newer models can be purchased as well. The Polaroid camera uses the same basic process for developing film as you would if you were developing film in a dark room. Rather than putting the film in the chemicals to develop them, the chemicals are kept inside one of the many layers of the film. These chemicals are activated by the taking of a picture. The fact that these chemicals need to be dispersed explains why the film develops more quickly if it is shaken. To compete with the speed of digital cameras, you need to speed up the load of the film. Here is the trick: Put in a used dark slide and you will find that there’s a remarkable speed difference. If you wish to have smaller Polaroid films, you could use the One 600. This the Polaroid camera produced last by the company. However, the pictures tend to be more “crisp” and higher quality when compared to older models. Consider buying film from a third party. For example, the 600 type of cameras will need Polaroid 600 film, but the price of the film is a bit steep. Rather than buying the designated film, you could purchase the first release from the Impossible Project. They have managed to produce monochrome films at a cheaper rate. Watch out for occasional special offers. These offers usually take place when sellers need to balance out their stocks. eBay is also a great place to look for deals on used cameras. Be sure to know the condition before buying because many sellers sell them for the piece only.